I’ve been having a love affair with Greek yogurt for a while now. I can’t get enough of the stuff. I eat it for breakfast, lunch, and snacks, so why not dessert too? 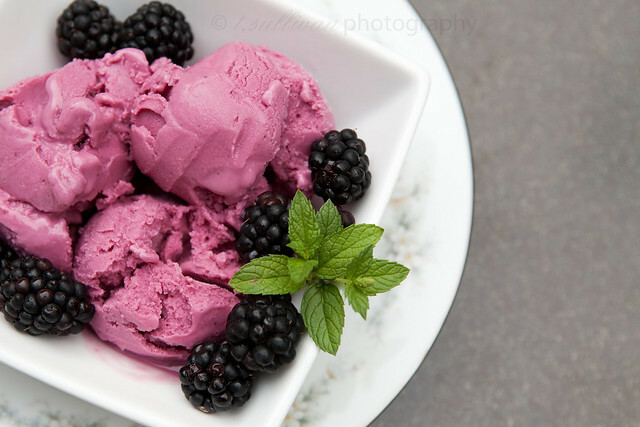 A few weeks ago, during one of our many 100 degree days this summer, I picked up a quart of fresh blackberries at the farmers’ market thinking they would be perfect for turning into frozen yogurt. And they were! I added some lemon zest and Limoncello to give it some zing. The alcohol also helps to keep the frozen yogurt from freezing up too hard. Just try not to love the vibrant purple color of this frozen yogurt. It tastes as good as it looks. If you have blackberries, this is a refreshing and fairly healthy way to cool off during these last few sweltering days of August! I used Chobani 0% Greek yogurt because it’s what I had on hand. It worked fine, but I think 2% or even full fat Greek Yogurt would yield a better texture and creamier frozen yogurt. Limoncello is an Italian lemon liquor that can be found at most liquor stores. Pulse sugar, lemon zest and mint leaves in food processor until sugar is damp and fragrant. Add yogurt, blackberries, lemon juice and Limoncello. Process until uniform in bright purple color and texture. Push mixture through a mesh sieve into a 4 cup container to remove seeds and leaves. Cover and chill overnight. Churn in your ice cream maker according to instructions. This is so pretty and it’s perfect because I made some blackberry frozen yogurt last summer, but never posted about it so I completely forgot the recipe. Now I can use this one! My freezer is still full of all the blackberries I picked last month, so this is a good excuse to use them up. that looks utterly delightful! so yum! Wow…this looks beautiful and delicious….healthy, too. I wish I can have a scoop! I would love to try, Thanks very much for sharing. 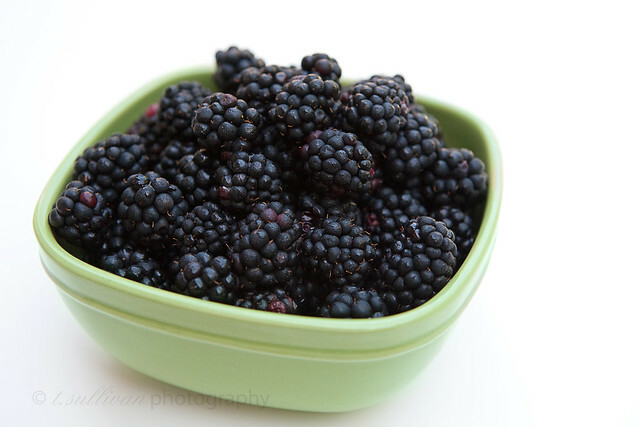 Blackberries are one of my favorite fruits and especially when it comes to froyo: perfect combination! The color looks amazing in the photo which makes it that much more appetizing. Thank for sharing this!